Lower Byre01775 760938 work Self-cateringLower Byre is located in the sleepy village of Weybourne, close to the towns of Holt, Blakeney and Sheringham. This beautiful barn conversion sleeps 4/5 people and is the perfect resting place after a long days exploring. It has been converted to a high standard. The lounge and dining area is open plan and the fully equipped kitchen is on a mezzanine that overlooks the open plan area. There is a twin bedroom, a double bedroom and a galleried study/bedroom. There is also a family bathroom. Outside there is a small garden, with garden furniture and private parking. It's a unique property in a beautiful and peaceful area. 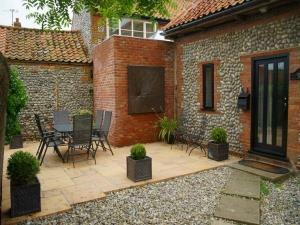 The property is perfect for families and couples alike as a convenient base from which to enjoy your holiday in North Norfolk. It is situated in the centre of the village a quarter of a mile from the beach. There is a shop, pub and restaurant, all within walking distance. It's an ideal base for walking, bird watching, fishing, golf, sailing and local tourist attractions.